Definition at line 43 of file basicsurfeval.h. Definition at line 45 of file basicsurfeval.h. Definition at line 164 of file basicsurfeval.cc. Definition at line 148 of file basicsurfeval.cc. 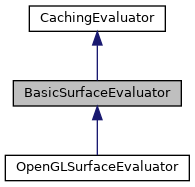 Referenced by Backend::bgnoutline(), and Backend::surfmesh(). Definition at line 90 of file basicsurfeval.cc. Definition at line 218 of file basicsurfeval.cc. Definition at line 180 of file basicsurfeval.cc. Definition at line 194 of file basicsurfeval.cc. Definition at line 82 of file basicsurfeval.cc. Definition at line 49 of file basicsurfeval.cc. Definition at line 74 of file basicsurfeval.cc. Definition at line 172 of file basicsurfeval.cc. Definition at line 156 of file basicsurfeval.cc. Referenced by Backend::endoutline(), and Backend::surfmesh(). Definition at line 98 of file basicsurfeval.cc. Definition at line 226 of file basicsurfeval.cc. Definition at line 188 of file basicsurfeval.cc. Definition at line 210 of file basicsurfeval.cc. Definition at line 132 of file basicsurfeval.cc. Referenced by Backend::linevert(), and Backend::tmeshvert(). Definition at line 140 of file basicsurfeval.cc. Referenced by Backend::linevert(), Backend::surfmesh(), and Backend::tmeshvert(). Definition at line 106 of file basicsurfeval.cc. Definition at line 116 of file basicsurfeval.cc. Definition at line 124 of file basicsurfeval.cc. Definition at line 57 of file basicsurfeval.cc. Referenced by Backend::bgnsurf(), and Backend::bgntmesh(). Definition at line 65 of file basicsurfeval.cc. Definition at line 202 of file basicsurfeval.cc.